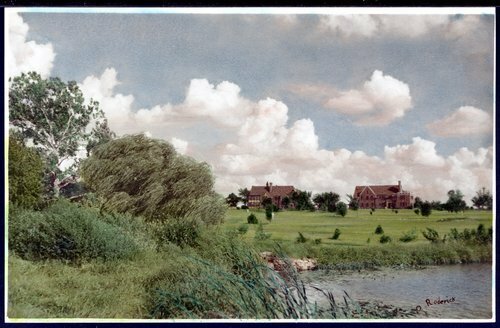 This colored photograph of the East and West Lodges was given by Dr. John Crabb. A major contribution of Menninger Clinic may be that at a time when custodial care or the asylum were the only alternatives for the mentally ill, the Menningers brought a positive commitment to psychiatry. They did not believe that the fate of mentally ill people was to be warehoused; they believed mental illness could be treated. The Menningers brought hope for troubled persons everywhere.